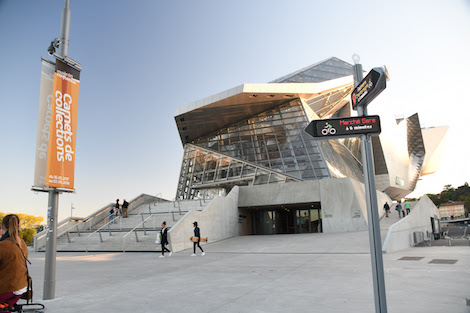 The first iGirouette smart signage devices have been installed in Lyon, France next to the Confluence Retail and Leisure Centre and ice rink. We first saw these several years ago, then again most recently at #ISE2017 and were mightily impressed. These are genuine urban innovations! The iGirouette conveys different types of messages to help everyone navigate the urban environment, improving the flow and interaction of people and transport. Initially, the message will display general information: sports and cultural events, distances (e.g. to the Confluence museum or Perrache train station), directions to the Youth Centre and exhibition spaces, etc. Later, thanks to OPEN DATA, information such as the number of available parking spaces, or bus and train schedules, will be communicated. The device is made up of a mast with two rotating arrows, each of which can rotate 360 degrees. iGirouette interacts with individuals, providing directions and information concerning the time and distance to a specific event or place, by displaying both text and still or animated images. We are told that the iGirouette concept relies on a revolutionary, multilingual digital control system that allows for real-time communication. It can also interact with users who are connected through a mobile app, by guiding them toward events. With 40 years of expertise in electronic signage, Charvet Digital Media, an ISO 9001 certified French manufacturer, specializes in designing, manufacturing, installing and maintaining indoor and outdoor digital media solutions that are innovative and connected. These include local digital newspapers and digital advertising displays for local authorities, large retailers, and key accounts. To date, over 10,000 customers have placed their trust in the experience and know-how of Charvet Digital Media, which controls each project from start to finish. This entry was posted on Tuesday, November 21st, 2017 at 13:34 @607 and is filed under DailyDOOH Update. You can follow any responses to this entry through the RSS 2.0 feed. You can leave a response, or trackback from your own site.